Despite my prerace fears, there was nothing to worry about when it came to race day. The next morning, as I was getting ready to run, Madeline and Harrison were whisked away on the safari Land Cruisers with the other spectators. There was a viewing area that the runners passed by twice. It was so well organized. My kids said they enjoyed cheering on the other runners from our Wildside home base, as well as making friends with other spectators. That was a big relief for me! The starting line was a party. Most races are – we runners like to have fun – but you never know what to expect when you’re literally in the middle of nature. Case in point, the start was delayed 30 minutes so race staff could get elephants off the course. You read that right, elephants. I later learned my kids and the other spectators encountered the elephants while driving out to their spectating post. This experience had to only add to the excitement of their day. Like Petra Desert Marathon (also organized by this same “adventure race” travel company – Albatross), I knew this course was going to be a challenge to finish without any time constraints. My game plan was to run the portions that I could and just survive the more technical portions of the course any way possible. I even galloped down one of the longest and toughest hills on the course. It was so steep I couldn’t even comfortably put one foot in front of the other, so I had to get creative. The Big Five Marathon starts at an altitude similar to the altitude in Denver – 1,500 meters of elevation. To add to the “adventure”, the course begins with an uphill climb. When I started to run, I immediately became aware of the lack of oxygen in the air. 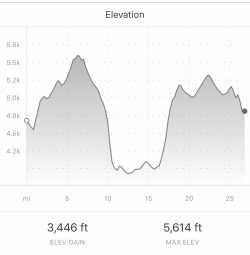 Combined with the climb, I felt doubt entering my mind almost right away about whether I could complete this race and all of its challenges. Thankfully, I pressed onward – trying to ignore my doubts. After about two miles, my body began to adapt to the altitude. 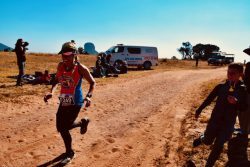 Between the uneven terrain, climbs that were not runnable, 9 km (about 5.5 miles) of deep sand, and the steepest descents I have ever encountered, the race continued to challenge – right to the very end. There were certainly unique challenges throughout the 26.2-mile test. The race was over, but our family adventure sure was not. My kids and I continued our African safari adventure for another seven days after the race. We moved to a different tented camp after our six-day stay at Wildside. This new camp, Manyeleti, was on the edge of Kruger National Park – a seven-hour drive from where we had been staying in Entabeni. We have many exciting tales to tell. Thankfully, these stories are centered on the animals we saw rather than more ATM transactions gone bad. 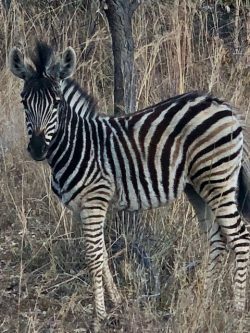 We were fortunate to have seen all of the animals that make up the Big Five: elephant, rhino, water buffalo, lion, and even the elusive leopard. 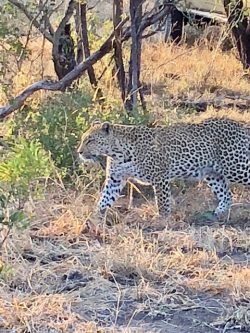 With the exception of the leopard, we saw all of Big Five animals and plenty of other wildlife – many, many times. We witnessed lions finishing off their kill (a giraffe) while a large pack of hyenas waited impatiently for what was left after the lions to move out. The loud, unruly hyenas would eventually get their way: After the lions left, they moved in to feast, nearly polishing off even the bones of the giraffe. We also met some pretty amazing people on this trip. Sharon Ryder from Australia was the female winner of The Big Five Marathon. Sharon has an amazing running resume. She has many marathon times under the 3-hour mark. In 2013, she started with the elite women at Boston Marathon. Her outgoing, vibrant personality made her the life of the party at Wildside Camp. My kids and I were fortunate that she had, like us, chosen the Kruger extension. I am always talking about how great my fellow runners are as people, but it was extra special that Madeline and Harrison got to experience this first-hand. Thanks, Sharon! We camped with her in Manyeleti Reserve, as well as Entabeni. I look forward to looking up the finish time of her next race – Chicago Marathon. I am in awe of her athleticism. Another family who became special to us during the second portion of our trip was Phil, Grace, and Annette Hiom from British Columbia, Canada. Phil and Grace are a couple who run a trail racing company called Dirty Feet Racing. They are talented trail and ultra runners. Annette is Phil’s mom. She’s a marvel. At nearly 71 years old, she also ran The Big Five Marathon. Just as impressive, she didn’t even start running until after she turned 50. She’s certainly making up for lost time. She now has many marathons under her belt, and she plans to continue racing indefinitely. I am in awe of our new Canadian friends, and I appreciate that they hung out with me, Harrison, and Madeline the whole five days we were at Manyeleti Reserve. 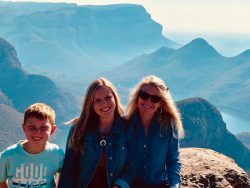 We shared most meals and all of our game drives with this lovely family. I would like to thank everyone who played a part in this adventure of a lifetime, especially my family. I know how lucky I am to have Allen, my loving and supportive husband and all of my children, though Madeline and Harrison get extra praise here. Both were great travel companions for my second African adventure. The memories that were made during the trip and the lessons learned will forever be cherished. So, despite some bumps in the road… both literally and figuratively, my kids and I had a fantastic trip. We learned so much from the people we met. Some lessons were more welcome than others. I will forever be more aware of my surroundings when using an ATM. (Shame on me for being lax at the Johannesburg Airport. I should have known better.) We also learned some lessons from the animals. Did you know lions mark their territory during the night? We didn’t! Remember that air horn we were introduced to at our arrival to Wildside Camp? I was the lucky camper who got to use it – while I was in a state of sheer panic. On race night, a pride of lions decided our tent was their territory. They were just a few feet from the side of our tent roaring and growling loudly. Feeling helpless and frightened like never before, I only knew of one thing to do – sound the air horn (multiple times). But the noise only agitated the lions. Their roars frightened not only us, but the ranger who came to chase them away. In the morning, we learned they were only about “one meter” from our tent (so, in other words WAY TOO CLOSE!). But, again, I’ll chalk it up as another learning experience. Another adventure. 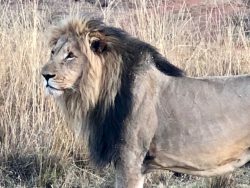 Now that we’re safely away from the lions, I can say encountering a group of agitated lions makes for an unforgettable story – and lasting memories for two of my children. They’re what make everything worth it, after all. Fascinating read! Thank you so much for sharing. Congratulations on your accomplishment. What an exciting summer adventure for your children. A trio to remember for a lifetime. Michelle wow, thanks so much for your kind comments – I’ll think of you when I run Chicago! Your blog is an inspiring read and makes me want to return to our experience – minus the tough parts of the race!! Thanks for sharing.